Have you ever wondered what becomes of the millions of Krathongs which are released in to the sea, rivers and lakes. 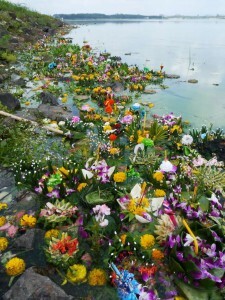 This (photo below) is Lake Mabprachan the day after the Loy Krathong Festival. Fortunately, the Krathongs are mainly made of natural or biodegradable materials such as banana tree and flowers. More amazing Thailand Songkran photos (below) from the 17th to the 19th April 2012. Cracking photos of cracking shots from the Pattaya Songkran festival, otherwise known as the World’s biggest water fight.